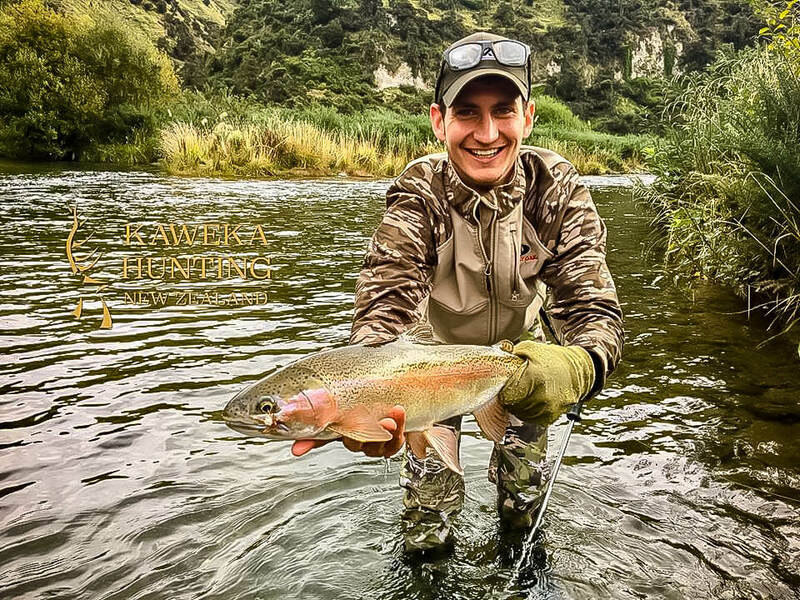 Fly fish for a Rainbow or Brown Trout in New Zealand! Just a few minutes north of our ranch, the headwaters of the Mohaka River drains the Kaimanawa and Kaweka forests flowing south-east before merging the Pacific Ocean in the Northern Hawke’s Bay region. A diverse range of trout angling opportunities are available on the Mohaka. The river holds a good population of quality healthy rainbow and brown trout with many of trophy size. Trout vary in size with an average of 1.5 kg (3 ½ lbs) with larger fish tipping the scales at over 4 kg (9lbs). The Mohaka River drains a considerable area of land. The upper reaches and its many tributaries flow through around 20 km of remote native bush, providing top-quality wilderness fishing for a good population of large, mostly brown trout. The Mohaka River is suitable for all types of fishing. The most popular and productive method is using a nymph although there is plenty of opportunity for the wet fly fisherman and those wishing to pursue trout with a dry fly. There is also excellent spinner fishing opportunities throughout the length of this river. For serious anglers wishing to venture further afield, other celebrated rivers for fishing within the region include the Tutaekuri, Ngaruroro, Waipawa and the Tukituki.